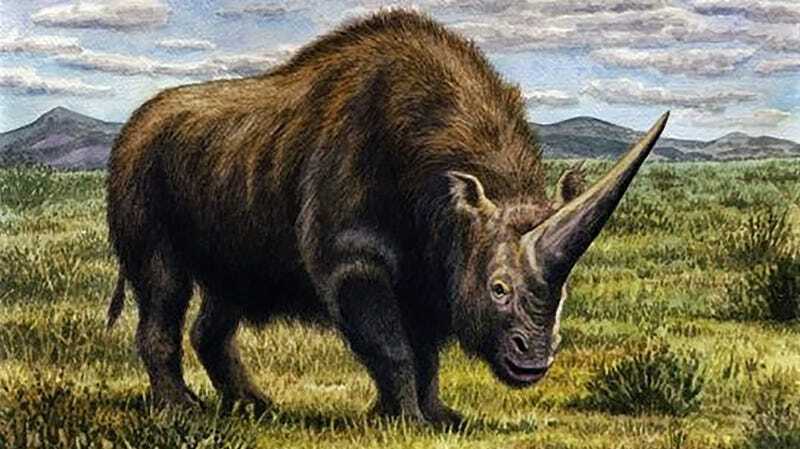 Artist’s impression of the “Siberian unicorn,” actually a species of rhino. Weighing up to 7,700 pounds, Elasmotherium sibiricum—an extinct hairy rhino popularly known as the “Siberian unicorn”—was thought to have disappeared as long as 200,000 years ago. An updated fossil analysis suggests this formidable species was still around some 39,000 years ago, and that Ice Age conditions, not human hunters, contributed to its demise. Paleontologists know of around 250 rhino species, of which only five still exist today. Among the most spectacular of these rhinos was Elasmotherium sibiricum—the Siberian unicorn. For the Neanderthals and modern humans who lived alongside and possibly hunted this massive creature in Eastern Europe and Central Asia, it must’ve been an impressive and deeply intimidating sight. Fossil evidence suggests Elasmotherium weighed over 3.5 tons, was covered in a thick coat of hair, and sported a horn of biblical portions, possibly as long as three feet (1 meter) in length. Impressive though it may have been, the Siberian unicorns eventually died out. Previous fossil dating suggested an expiry date at some point between 200,000 and 100,000 years ago, long before the large-scale late Quaternary megafaunal extinction, which got rolling around 40,000 years ago. New research published this week in Nature Ecology & Evolution is now offering a more reliable estimate, dating the demise of Elasmotherium at some point between 39,000 and 35,000 years ago. The extinction of the Siberian unicorns, therefore, can now be connected to the late Quaternary megafaunal extinction, an event that witnessed the end of the wooly mammoth, Irish elk, and saber-toothed cat. Writing in their new study, led by Adrian Lister from the Natural History Museum in London, the researchers said “no absolute dating, genetic analysis or quantitative ecological assessment of this species [had] been undertaken,” which explains why the prior extinction estimate was so far off. The new study overcomes these shortcomings, and includes the use of updated fossil dating techniques. For the study, an international team of researchers from the UK, Netherlands, and Russia took a closer look at 23 Elasmotherium specimens, including a pristine skull kept at the Natural History Museum. An improved radiocarbon dating technique resulted in the revised extinction dates; many of the samples were slathered in preservation materials, requiring careful preparation for the carbon dating. In addition, the researchers succeeded, for the first time ever, in extracting DNA from the Elasmotherium fossils. The ensuing genetic analysis showed that Siberian unicorns split from modern rhinos around 43 million years ago, “settling a debate based on fossil evidence and confirming that the two lineages had diverged by the Eocene,” the researchers wrote in the study. These Ice Age rhinos are the last species of a “highly distinctive and ancient lineage,” according to the research. Siberian unicorns lived alongside anatomically modern humans and Neanderthals. That ancient hominids may have preyed upon these oversized rhinos is not as outrageous a proposition as it may seem. Early humans, likely a form of Homo erectus, were hunting rhinos in the Philippines around 700,000 years ago. But while rhinos were on the hominid menu, this new research suggests climate change, and not hunters, was responsible for Elasmotherium’s demise. These rhinos, as we now know from the new research, lived during the Ice Age just prior to the Last Glacial Maximum—the stage at which the ice sheets covered their largest area, around 26,500 years ago. Earth was prone to dramatic climate shifts during this period, producing drought, desertification, a drop in sea levels, and the steady encroachment of glaciers. These climactic disruptions proved fatal to many species, Elasmotherium among them. For the Siberian unicorn, this meant a loss of habitat, and by consequence, the disappearance of a critical food source, as the new study hypothesizes. In experiments, Lister and his colleagues analyzed stable isotope ratios from the fossilized rhino teeth. The researchers sought to link various plants with the levels of carbon and nitrogen isotopes in their teeth. Siberian unicorns, as this analysis revealed, lived in a dry steppe environment where they chomped on tough, dry grasses. The rhinos, with their highly specialized grazing lifestyle and naturally low population numbers, could not adapt quickly enough to the rapidly changing conditions, the study suggests. A changing climate, and not humans, were thus responsible for the demise of E. sibiricum. Interestingly, it’s a conclusion that jibes well with similar, but unrelated, research, in which scientists claim that humans weren’t responsible for many megafaunal extinctions of the Ice Age. Sadly, the same cannot be said for the ongoing sixth mass extinction, which is most certainly our fault.